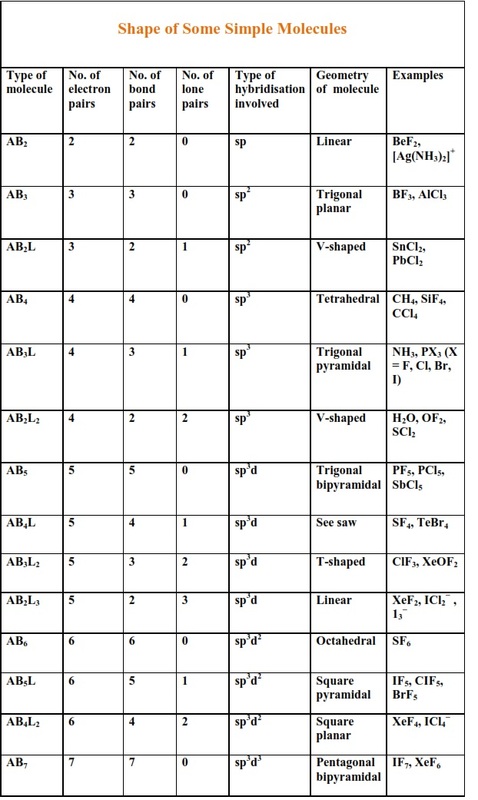 Chemistry is one of the easiest and scoring subjects according to most of the students. Students should focus more on theory part as compared to numerical part because 80% questions are being asked from theory part in WBJEE. Students always get 2-3 questions from this chapter in the examination. Here, you will find that the levels of the questions are bit low as compared to JEE and UPSEE exams. 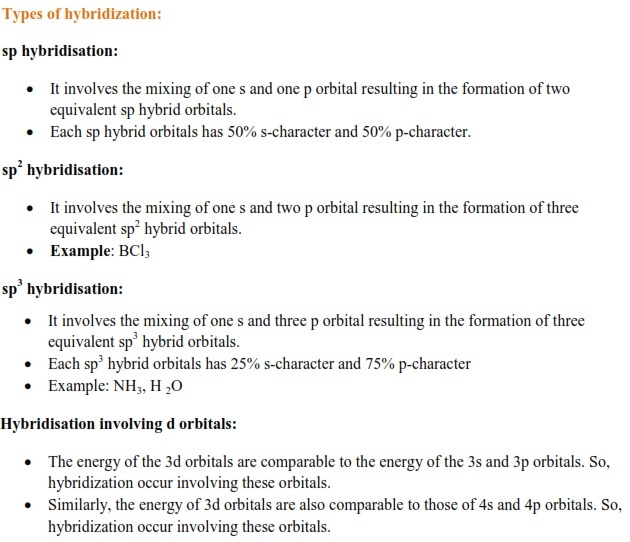 In this article, WBJEE aspirants will get study notes on Chemical Bonding based on the latest syllabus of the examination. Apart from previous years’ questions, we are also providing few more questions from the mentioned topics for the practice purpose. 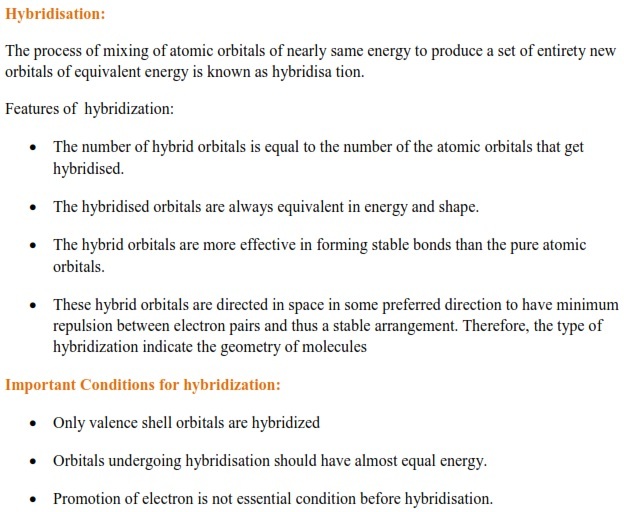 The concepts given in these notes like Hybridisation, Valence Shell Electron Pair Repulsion (VSEPR) Theory will also help students in solving questions from other chapters too. 1. The shape of a molecule depends upon the number of valence shell electron pairs (bonded or non-bonded) around the central atom. 2. Pairs of electrons in the valence shell repel one another since their electron clouds are negatively charged. 3. 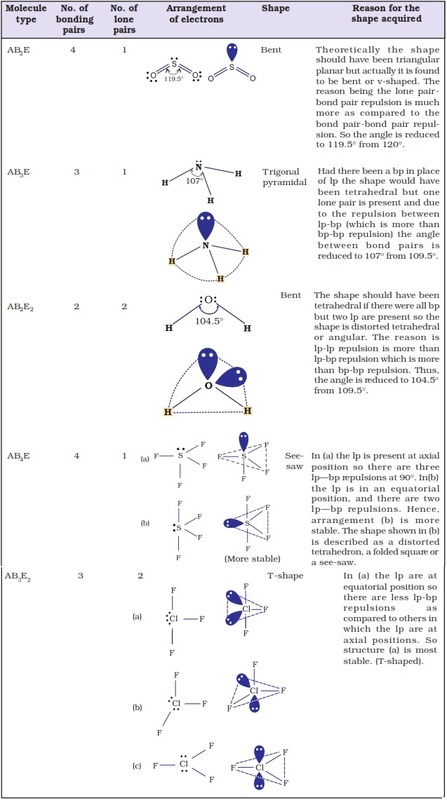 These pairs of electrons tend to occupy such positions in space that minimise repulsion and thus maximize distance between them. 4. The valence shell is taken as a sphere with the electron pairs localising on the spherical surface at maximum distance from one another. 5. 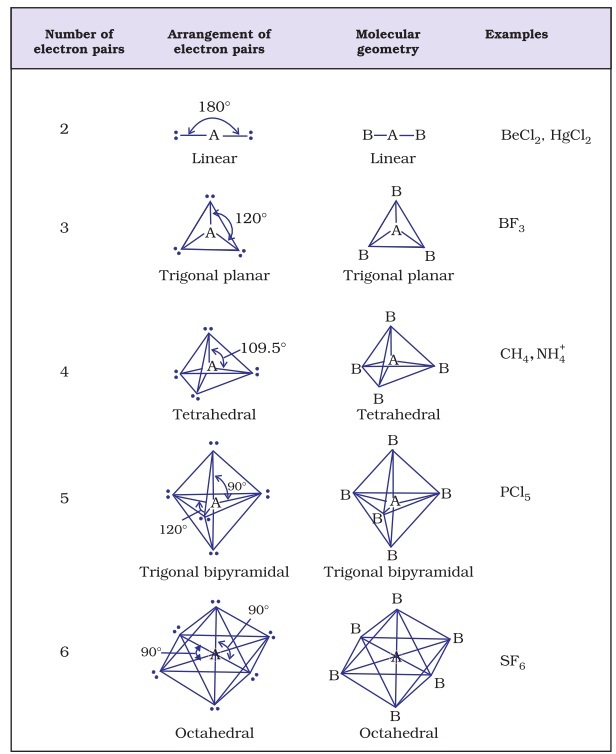 A multiple bond is treated as if it is a single electron pair and the two or three electr on pairs of a multiple bond are treated as a single super pair. 6. 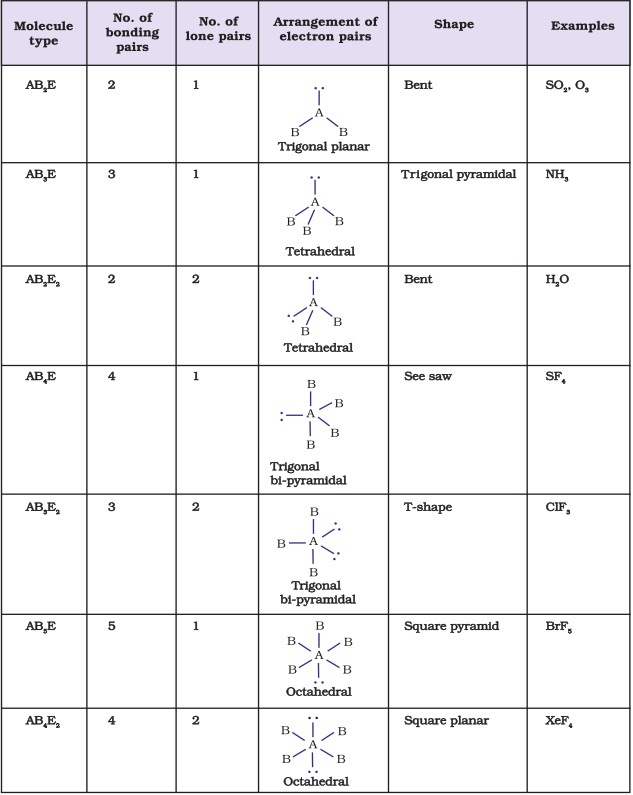 Where two or more resonance structures can represent a molecule, the VSEPR model is applicable to any such structure. In Marshall’s acid or peroxodisulphuric acid (H2S2O8) O – O bonding is present. Hydrogen bonding plays a central role in which of the following phenomena? HCl does not form hydrogen bond. 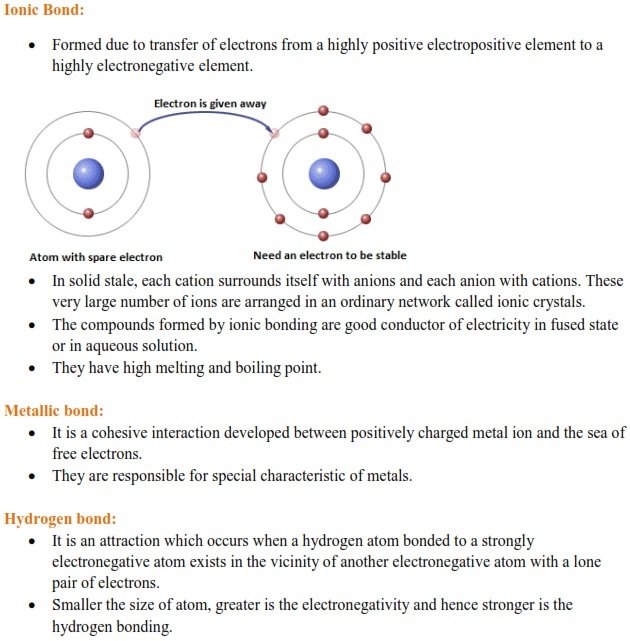 For the formation of hydrogen bond, at least one hydrogen atom must be bonded to one of the three most electronegative atoms O, N and F.
These revision notes will help you to grasp all the important concepts related to chapter Chemical Bonding. With the help of previous years’ solved questions given in these notes students will get to know about the difficulty level of the questions. Student can refer these notes just before the examination and save their precious time.